NAMM 2018: You can usually rely on the NAMM Show to throw up a couple of eye-catching new products that feel like they’re come from nowhere, and Sonicware’s Gadget Synth ELZ_1 could be a case in point. 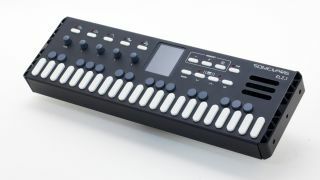 Looking like a cross between a slimline MIDI keyboard controller and Teenage Engineering’s OP-1, this compact synth contains FM, 8-bit, DNA Explorer, SiGrinder, Standard Osc and Low-Bit Osc synth engines, so its sound palette should be substantial. There are also filters, EQs, effects and an arpeggiator.